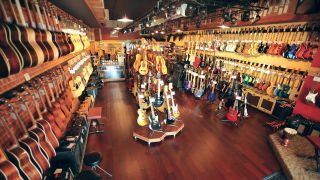 In the heart of Edwardsville, Illinois, is a guitar player’s paradise known as Mojo’s Music. Owner Bob Moggio is a professional musician himself, his last name adding the “mojo” to the shop’s mix when he opened the location back in 2000. Moggio, who’s passionate about guitars (and his customers), has spent the past 18 years redefining the “guitar shop” experience in his unique guitarists’ goldmine. Bob Moggio: I have about 300 instruments in the shop. Most are guitars and basses, but we also have a fair amount of ukuleles and a small amount of band and orchestra instruments. That’s hard to say, but it’s probably one of our limited-edition Music Man BFR models. Very limited production, outrageous quilted tops, beautiful finishes — they’re just awesome guitars. For various reasons, some of them sentimental, the most famous guitar we ever had — and still one of my all-time favorites — was the Taylor Liberty Tree. Besides being an historical work of art and an incredible guitar, it got us a tremendous amount of exposure and publicity. I finally removed it from inventory and took it home to my personal collection. The lack of respect a lot of people have for our guitars. I call it the “GC Syndrome,” where people come into the shop and just start grabbing expensive guitars from the displays with no concern. It’s all I can do to maintain my “cool” when this happens. We have a fair number of touring acts stop in the shop as we are right down the street from a really cool venue. Over the years we’ve had Rick Derringer, John Waite, Martin Barre, Jim Messina, Leo Kottke and others come in. My personal favorite was Garry Tallent from the E Street Band. He was nice, friendly, easy to talk to and is in, perhaps, my all-time favorite band! We love what we do and we will do the very best we can to take care of each and every person that comes into — or calls — our shop. We don’t carry anything that we personally wouldn’t use or wouldn’t want a friend or family member to have. All of our gear is top-notch and we do our best to make sure it’s perfect before we put it into our customers’ hands. Unfortunately, it’s “Smoke on the Water,” and most of the kids have no idea what the song is, or that it has more to it than just the opening riff. What’s the best song to try out a guitar to? It depends on the guitar and/or amp. I have different ones I use to demo guitars, but it varies from electric to acoustic, from six-string to 12-string or even bass.